BarTender’s exclusive Intelligent Templates™ enable companies to produce a wide variety of flexible label designs without the need to create and maintain hundreds of separate documents. BarTender works great both “stand-alone” and integrated with other software. Bartender has always maintained and support a powerful capability for other programs to integrate with its application. This enables the power of Bartender to be merged with different types of specialized applications to have you unique requirements. 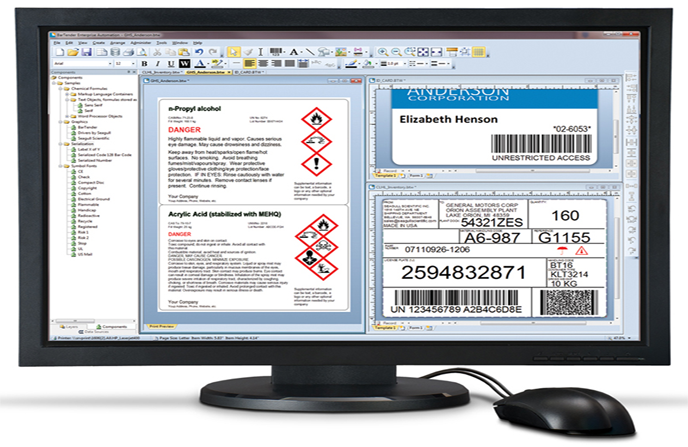 Talk to Accuware today if you have a need for Barcode Label printing when driven from other applications or ERP data. .Net SDK makes it easy to integrate Bartender. Accuware is a Microsoft partner. We can make Bartender function along with front end applications that use your business logic. Accuware already has integrations between Bartender and QuickBooks. You can leverage your existing QuickBooks data , and make it work with complex labels. There are multiple avenues to chose when integrating with Bartender. Drop files to trigger printing with commander, use Integration manager, command line control, and API’s. Support team based in Bellevue WA. Great support when you need it most.